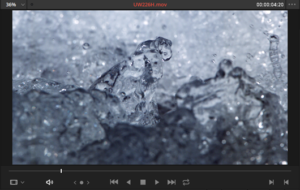 Last week, we explored importing media into DaVinci Resolve 14. 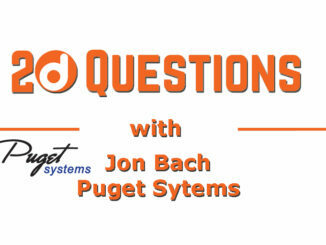 This week, we take the next step by finding and previewing media files. 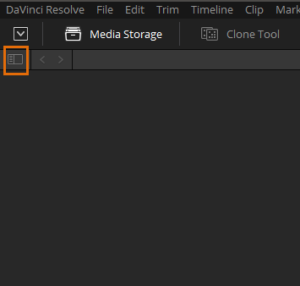 One of the great things about this latest version of DaVinci Resolve is just how easy it is to open and close panels to free up screen real-estate. 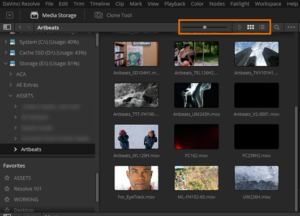 For example, if a name is white as in the ‘Media Storage’ name at the top of this panel, it means that you can click on that name to open and close it, freeing you up to close any panels you don’t need and stay focused on the task at hand. In addition, the little button at the top right (also showing white) indicates that the side panel populates all your attached drives, which can be open and closed to maximise the view of whatever folder you may be browsing. Also notice that with this side panel open, there is a ‘Favorites’ Section. This is a quick selection area where you can add anything to it, find the folder you want and simply click and drag it to the ‘Favorites’ section. 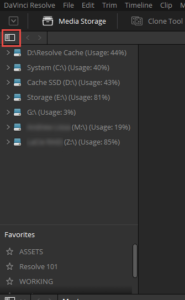 To remove any folder, right-click and choose ‘Remove Folder from Favorites’. You can also navigate to your media files in the normal way. Here you can see I have browsed to some assets from Artbeats which I may wish to preview and use in my project. The tools highlighted at the top of the panel allow me to zoom into the media for a better view, sort the media, view as icons (this is the presently selected view as seen by the white icon) or view in a list view. Moving your mouse over any clip WITHOUT selecting it will give an immediate live preview of the media in the preview window to the right. 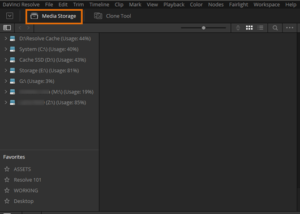 While it may appear that you could make selections of certain parts of your media at this point, you haven’t actually added that media to your project as of yet, so no selection of In and Out points will stick. At this point the viewer is for previewing the media so that you can select what to add to you project. Selections of which parts of the media you wish to use can be done once added. If you click on a clip so that it has the orange border around it, this will put it in the viewer so you can look at it more closely. Here is an explanation of the various buttons at the bottom of the viewer. 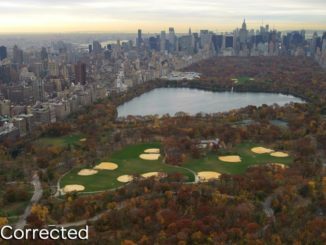 Set In and Out points – although this will only work on media actually added to the project. There is also a little bright vertical line above these controls which is a playhead which can be clicked and dragged as needed. Or, simply click on any part of the grey horizontal line about the icons to jump the playhead to that point. 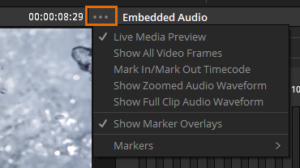 As well as the controls above, nearly all panels in Resolve have additional options somewhat hidden inside a little menu found by clicking on the 3 dots to the top right of each panel. 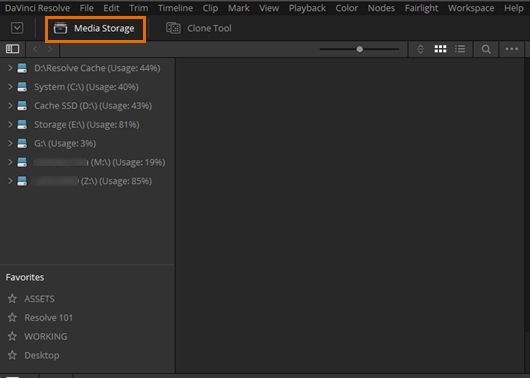 In the next tutorial, we’ll add media to the Resolve project, make our selections and create a timeline with our selected portions of our various clips.